A cold front moving south from the Rockies is expected to drop temperatures in some parts of Texas by more than 50 degrees. National Weather Service meteorologist Ron McQueen in Lubbock says the front will move into the Panhandle and other parts of West Texas late Monday. He described the front as "quite strong for late April," with pockets of air behind it well below freezing. Strong winds also are anticipated in some areas. McQueen says temperatures Monday in West Texas will reach 90 degrees, but then drop to freezing by Tuesday morning. In North and East Texas, temperatures are expected to drop from around 80 on Monday to highs in the mid-50s Tuesday. 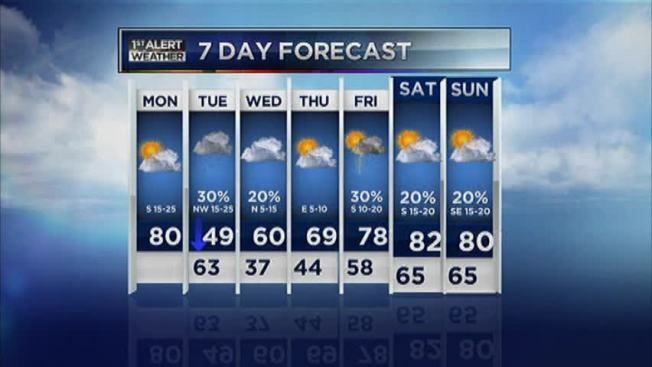 In South Texas, the weather service says lows will dip into the 40s Tuesday night.